FILE - Riot police stand guard at a blocked street outside the Supreme Court in Phnom Penh, Cambodia, Nov. 16, 2017. The White House announced Tuesday the U.S. is cutting about $8.3 million worth of aid to Cambodia because of "recent setbacks to democracy" in the southeast Asian country. 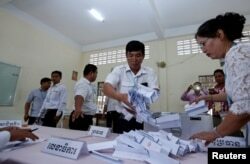 FILE - Members of the National Election Committee (NEC) count ballots during a senate election in Phnom Penh, Cambodia, Feb. 25, 2018. Chum Bunrong, Cambodian ambassador to the U.S., told VOA's Khmer language service that the reasons used by the U.S. government to make the announcement was the results in Sunday’s sweep by the ruling party in elections for Cambodia’s senate. “The election went smoothly. Some said the election was dominated by one strong party, while others are weaker, but it was a democratic election based on our law. If the election was illegitimate, the people would protest against it,” said the ambassador. FILE - A supporter of the opposition Cambodia National Rescue Party holds a portrait of the party leader Kem Sokha during a rally in Phnom Penh, Cambodia, Sept. 26, 2017. FILE - Rep. Steve Chabot speaks at House subcommittee hearing on Hong Kong, Dec. 2, 2014. VOA's Sok Khemara and Kimseng Men contributed to this report.